Intel and Google have entered a chip-development partnership, ensuring that Google’s Android system will run as optimized as possible on Intel processors in the future, starting with the 32nm Medfield Atom processors in 2012. This is part of Intel’s strategy to compete with the many ARM-based processors in the market, which have so far taken a staggering lead as the preferred platforms for mobile devices, whether phones or tablets. Intel’s latest Atom processors, codenamed Oak Trail, were launched earlier this year, and were meant for low-power mobile applications, mostly netbooks, laptops, and Windows-based (x86) tablets. Cedar Trail processors, due later this year in November, will once again be used for such form factors. The first Intel offering for ARM-based platform tablets (i.e., Android), are the Medfield processors, Atom SoC-design processors that will be due in early 2012, and will be meant for both smartphones and tablets. 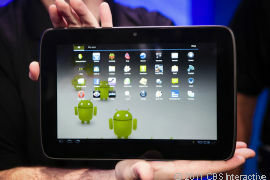 At IDF 2011, the venue for the announcement of the partnership between the two giants, Intel showed off a reference Android tablet running on a Medfield processor. The chip is a single-core SoC, and Intel will supply the reference design to tablet and smartphone manufacturers for them to design their own chips, devices based on it. The first Medfield-based mobile devices are scheduled to hit markets in the first half of 2012. "…as a [device maker] you'll be able to go out and build a device with the full blessing and backing of Intel and Google." "This was obviously just a technology demo since we have no plans to productise solar powered computing....yet, but it's a clear statement of the direction and capability of what we can do with our transistor technology."